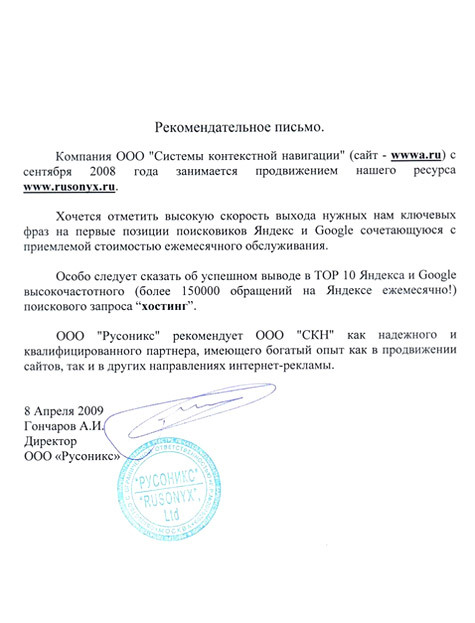 The Internet advertising agency "SKN" was found in 2003 by team of experts in site advertising. In further our activity received all new and new directions: since 2005 we are the accredited partner of company "Begun", since 2006 - we are the commercial partner of company "Yandex" that allows us to execute all complex of services in advertising on the Internet at the most comprehensible cost. We advertise our clients on Yandex, Rambler, Google, Aport, MAIL.Ru and many other search engines and platforms of the Russian and foreign Internet. Big experience of Internet campaigns gives us representation about advertising possibilities on the Internet, its features and components, therefore we offer our clients the most suitable strategy and tools. Advertising agency "SKN" The advertising agency uses only the ethic and resolved methods of advancement, watches closely all changes in algorithms of search engins and offers clients exclusively qualitative performance of necessary tasks. We attract attention to the most effective advertising on the Internet - context advertising as only it allows to capture quickly the greatest target audience and instantly receive consumer reaction. We are not limited only to contex advertising, our company makes banners of any complexity and will organise their placing on the largest platforms of the Russian Internet, providing maximum efficiency of their design and published it in the world wide web. One of distinctive features of advertising agency "SKN" is that we work not only with large budgets, but also with small advertising budgets from 7000 rbl. (~$250). Nevertheless, we guarantee high quality of our services for each client, without dependence against the chosen tariff plan. Call +7(495)771-55-57, or send an order through the feedback form - We are always glad to answer on all your questions!